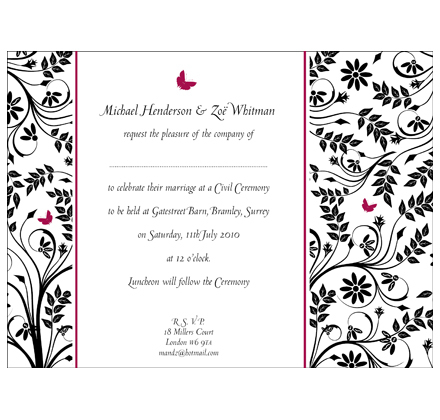 Butterfly Style from The Letter Press of Cirencester is a flat card style with a bold floral pattern on either side of your personalised wording. The thing that brings this card to life however is the clever use of block foiling after the print process. Many designers overdo the foiling on a card design because they know that once the process of foiling a design has been decided on it costs virtually the same to set a machine up to foil the whole card as it does just a tiny portion of the design. With this design, the Letter Press have realised that less is more and the 3 delicate foiled dancing butterflies and 2 thin strips of foil shielding the personalised text from the floral pattern is just enough. The invitation looks striking and sophisticated. Standard options for this design are flat black ink on an 8 x 6″ brilliant white wove single card. 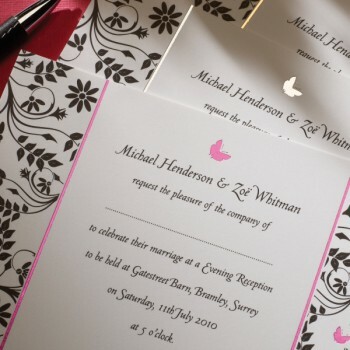 You can also choose different foil colours but we think the pink against the black print looks particularly stunning. Consider pink tissue lined envelopes as a complimentary extra.